Discovered as shining yellow nuggets centuries before Christ, Gold is the first and one of the most precious metals known to man. Gold’s rarity and resistance against tarnish made it a popular choice for crafting jewellery among the Egyptian Pharaohs, a trend which continued to be followed as a religion around the world. The practice of adorning the neck with shells, teeth and claws has been around since early days of mankind but the use of Gold for making chains started only around 2500 BC and ever since it has enjoyed a coveted place in jewellery. Modern day men and women, both equally adore chains and to cater to their swelling love, TJC has put on display an extensive collection of 9K, 14K, 18K and 22K Gold Chains. While chains have held both positive and negative meanings throughout the history, Gold Chains are said to indicate a divine connection between man and God symbolising man’s unshakable faith in God. TJC also offers some exquisite pieces in the elegant and resplendent White Gold and distinctly feminine Rose Gold for the ladies in UK. Chains are versatile pieces and are indispensable for any woman’s jewellery collection. Wear gold chains solo every day for a put-together and sophisticated look or add a gemstone pendant perhaps a diamond for a glamorous look at a special occasion. 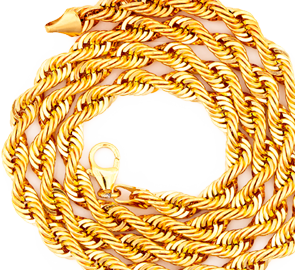 TJC has a rich assemblage of Gold Chains crafted by our skilled artisans in a variety of styles including Rope, Curb, Snake, Belcher, Figaro, Snake, Omega, Byzantine and Spiga. To cater to the varied needs of the style-conscious men and women, we have luxury pieces under our in-house brand Iliana, contemporary pieces in the Royal Bali collection and designer necklace style chains as bold and statement pieces. Pick the long gold chains in 20, 22 and 30 inches from our collection for a chic and stylish layered look. Choose a style that appeals to you the most and you will love donning every now and then.